» Faculty of Education » Home » Slack: a new tool for education? Slack: a new tool for education? In offices all across the world, email (especially Microsoft Outlook) is one of the main technologies to facilitate group collaboration. As part of Microsoft’s Office suite, Outlook software has considerable features for group communication, time management and contact management – yet some have recognized how impractical it can be as they see their inbox cluttered overflowing with emails on a daily basis. Enter Slack. Slack is an online communication platform and collaboration app, which transforms email into a group activity, giving users the opportunity to create topic-specific channels where discussions can take openly within teams. Launched in 2013, Slack’s user platform has swelled dramatically to over 2.3 million users, making it one of the fastest-growing communication platforms today. Within the platform, people can quickly and easily exchange information and chat with colleagues, attach files for sharing, send emoji, search and customize their Slack screen. Since 2014, Slack has become an important communication and collaboration tool at UBC, with teams including the Learning Technology Users Group, Centre for Teaching, Learning, and Technology, UBC Learning Technology Rovers, UBC Library IT and the UBC Faculty of Science IT. The Slack chat room interface, with public and private communication channels and a direct messages between colleagues. Screenshot by Jeffry Pincus. For the UBC Learning Technology Rovers, Slack is particularly useful as team members are spread out across the Vancouver campus providing support within their respective faculties. The LTR Collab team provides a centralized forum online where tech rovers can chat and exchange messages. Private channels are developed to brainstorm ideas, coordinate between team members, share files, pose tech-related questions, agree on project details and arrange meeting times and deadlines. Rather than having to send bulky emails to a larger group of people, messages can be posted and sent out to the general channel. In addition, the search feature saves time spent finding the most relevant information. Some are now taking the chat platform one step further, proposing that it could be used as a learning technology within courses. However, while Slack has the potential to be used for online education, since the platform is hosted in the US, use in courses goes against British Columbia’s FIPPA (Freedom of Information for the Protection of Privacy) laws. Having identified a need for real-time communication in online courses, Ian Linkletter from the Faculty of Education is currently working with CTLT and UBC IT to pilot a similar chat platform. Two standout candidates include Mattermost and Rocket.Chat. As open source alternatives to Slack, Mattermost and Rocket.Chat have the potential to be hosted here at UBC and used for internal course communication and group collaboration. Both platforms feature private and public chats, including one-on-one communication, archiving, and the ability to upload files from any browser or device. Evaluation and testing of Mattermost and Rocket.Chat has begun. If pedagogical, technological, usability, and accessibility requirements are met, a single-course pilot could take place as soon as May 2016. Update: We have been piloting Mattermost! Read about the Mattermost Chat Pilot, as well as the One Year Update blog post! Slack: When it Makes Sense to Use it. 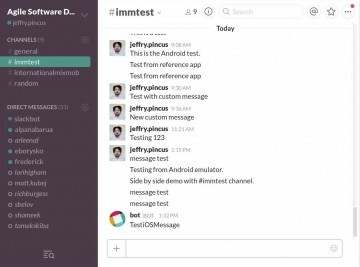 Slack: Is the Collaboration App a Hit or a Miss?